It’s that time of year. The time to be Thankful for the things in your life that make you happy. In my case, one of those things are the Bills so here are Ten Reasons I’m Thankful About the Buffalo Bills. I’m Thankful that the Bills don’t play on Thanksgiving this year. I don’t need the stress of a Bills game on Thanksgiving. The only stress I invite on Thanksgiving is the stress of eating so much that the button on my pants may pop off at any given moment. That’s all the stress I can handle. The Bills last game on Thanksgiving was in 1994 when they lost 35 – 21 to the Detroit Lions. 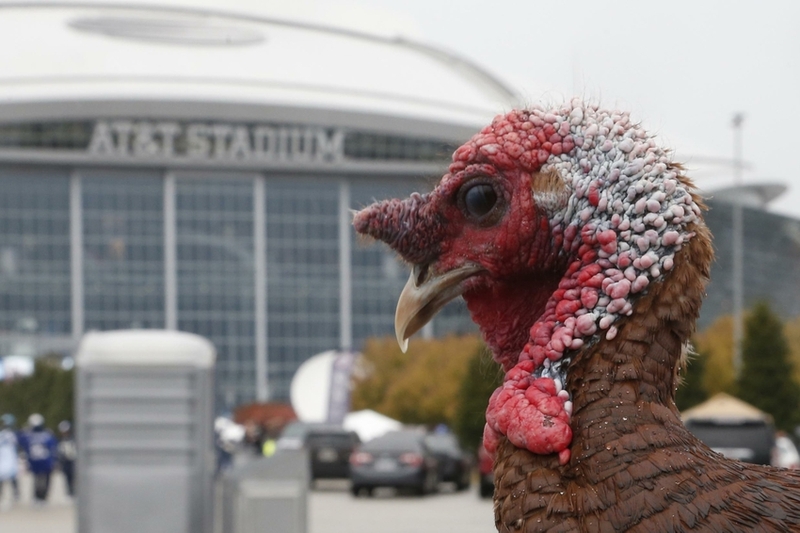 I hope that’s the last time they ever play on Thanksgiving. I’m Thankful that Doug Whaley is their general manager. Has Doug Whaley hit on every draft pick or signing he has ever made? No. Do I think he is a damn good general manager? Yes. He’s added some quality talent to the team despite some serious cap restraints. In 2015, they signed Richie Incognito and Tyrod Taylor while trading for LeSean McCoy completely reshaping the Bills offense for the better. In 2016, he had little cap space and signed Zach Brown and Lorenzo Alexander to bargain deals. Brown has the fourth most tackles in the league while Alexander is in a three-way tie for the lead league with 10 sacks. Whaley has way more hits than misses and that is why I am thankful for him. I’m Thankful that Rex Ryan is their head coach. – Don’t get me wrong. I am not here to praise Rex Ryan as a coach. I’m not in the “fire Rex camp” or the camp that loves him. But I am thankful that he is an interesting person to have as the head coach and that he makes rooting and reading about the Buffalo Bills more interesting with some of his statements or actions. I don’t always appreciate what he says but I do appreciate the fact that he is saying it. It gives us fans something more to discuss and get’s the team more attention from the national media. I’m Thankful there is a chance that we could see Sammy Watkins and LeSean McCoy on the field at the same time again. Both players have had injuries over the past two years and the Bills haven’t had them both on the field at the same time nearly enough. When Watkins is able to return it might not be so painful to watch the Bills offense at times. It will also give the coaches a few games to judge Tyrod Taylor with his top two playmakers healthy as they have a looming decision in the offseason on whether to pick up his lucrative option. I’m Thankful that they have a favorable schedule for the remainder of the season. With a favorable schedule down the stretch, the Bills still have a chance. The combined record of the remaining teams they face is 24 wins and 37 losses for a .393 winning percentage. If you exclude the 8-2 Raiders, who are the Bills toughest remaining game, the records of their opponents drops to 16 wins and 35 losses. Buffalo gets to face a Jets team in Week 17 who might be experimenting with their quarterback situation. They get to play the 0-11 Browns, the 2-8 Jaguars with Blake Bortles who looks lost at quarterback and even Pittsburgh isn’t nearly as good as they have been in the past. There are many things to be thankful for on the schedule. I’m Thankful that they have mostly home games left. Four of the remaining six games left on the Bills schedule are at home. They get to play two of their toughest three games left in the season at home against the Steelers and the Dolphins. Miami has to come to Buffalo in late December which could mean favorable weather conditions for the cold weather Bills. I’m Thankful that the Bills make me feel. Win or lose, happy or sad, they make me feel tremendous ups and downs on Sunday’s. It’s a nice reminder of what life is all about. It’s about the journey sometimes not the destination. I’m Thankful for their owners Terry and Kim Pegula – I will be thankful for them every year the team remains in Buffalo. We could have been the team that moved to Los Angeles instead of the Rams. There are more and more articles about the Chargers or Raiders moving to Las Vegas every day. It really makes you appreciate how much the Pegula’s buying the team means to the area. Bills fans can sit back and relax and think “Not us”. anytime there are relocation rumors in the NFL. Thank you Terry and Kim Pegula. I’m Thankful for our Loyal Readers – Thank you so much for coming to us for Buffalo Bills news and opinions. We really appreciate your support of our work. Our site wouldn’t be anything without our readers so thank you very much for reading our work. On behalf of our entire staff, we are very thankful for YOU.